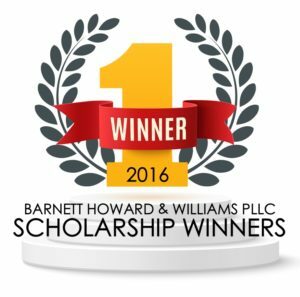 This was the first year for our law firm to offer scholarships. In honor of the sacrifices of our military veterans, we decided to that the scholarships should be connected to military service. The first scholarship is a $500 award for a Military Veteran Law Student and the second scholarship is a $500 award for a Military Dependent undergraduate student. Throughout the year, we received several applications from very deserving students. We appreciate all of the students that took the time to apply for the scholarships and wish them all the best in their studies. For those students that were not selected, we invite you to apply again next year as we plan to continue the scholarship offers as an annual award. James Crowder is a Marine Corps veteran that served in Operation Enduring Freedom. Mr. Crowder currently attends University of Houston Law Center. Congratulations James Crowder. Best wishes as you continue toward your law degree. Amanda Oblander is a US Navy dependent whose husband is currently serving in Coronado, CA. Mrs. Oblander currently attends the University of Phoenix and is pursuing a degree in marketing. Congratulations Amanda Oblander. Best wishes as you continue in your studies.